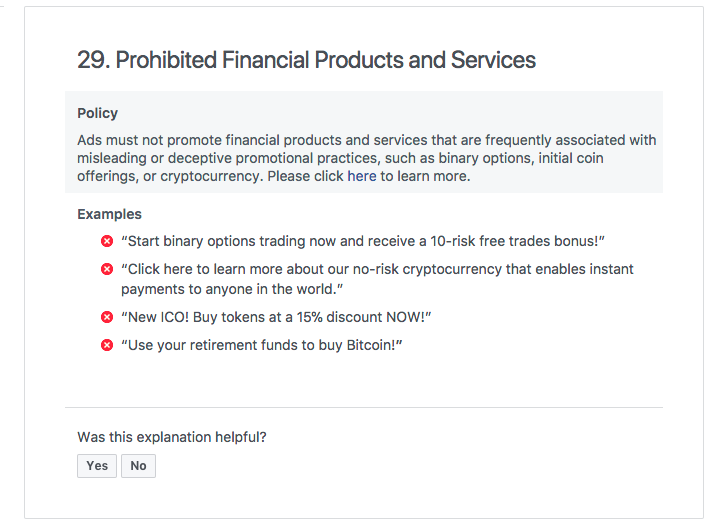 Facebook has a new advertising policy pertaining to cryptocurrency, binary options and initial coin offerings. The policy specifically prohibits ads that promote those types of products and services “that are frequently associated with misleading or deceptive practices,” Facebook Product Management Director Rob Leathern wrote in a blog post today. Cryptocurrencies like Bitcoin, Litecoin and Ethereum, and initial coin offerings have all hit the mainstream, which has promptly resulted in a number of scams. While Facebook says it wants people “to continue to discover and learn” about those products and services, “there are many companies who are advertising binary options, ICOs and cryptocurrencies that are not currently operating in good faith,” Leathern wrote. Leathern recognizes that the policy is quite broad, but he says that’s intentional. The plan is to continue working to better detect deceptive and misleading ads that pertain to cryptocurrencies, ICOs and binary options. Over time, Facebook says it will revisit the policy and its enforcement mechanisms as its signals improve. In the meantime, Facebook is encouraging people to report content that violates this policy. “This policy is part of an ongoing effort to improve the integrity and security of our ads, and to make it harder for scammers to profit from a presence on Facebook,” Leathern wrote.